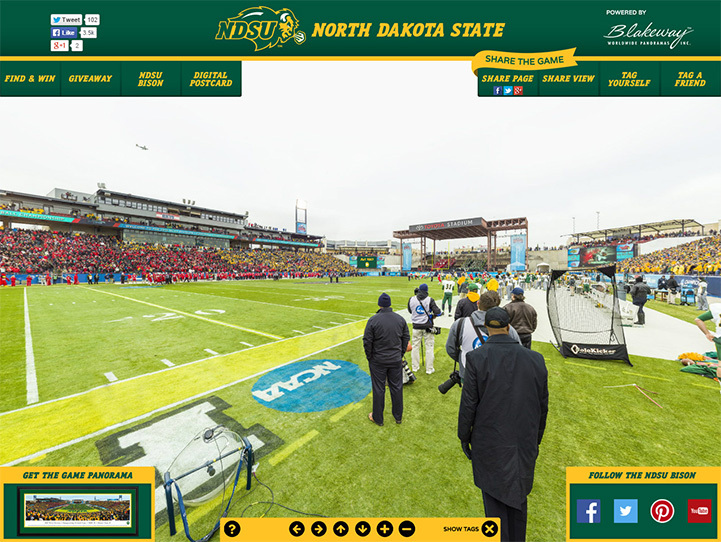 This panorama, taken by Christopher Gjevre, spotlights the reigning FCS national champion, the North Dakota State Bison, defending their title against the fifth-seeded Illinois State Redbirds. Having won the championship in 2011, 2012 and 2013, the Bison were not strangers to this coveted event. In the end, the game boiled down to which team made more plays, and on a cold Saturday in Frisco, Texas, once again it was NDSU. The Bison's 29-27 nail-biting victory over the Redbirds made them the first-ever Division I team to win four straight national titles and, with the win, they moved into a tie with only one other school for second place on the FCS title leaderboard, with four.